What are the defining characteristics of a culture's cuisine? It's no easy task, but Priceconomics have given it go by distinguishing between different cuisines simply using ingredients. 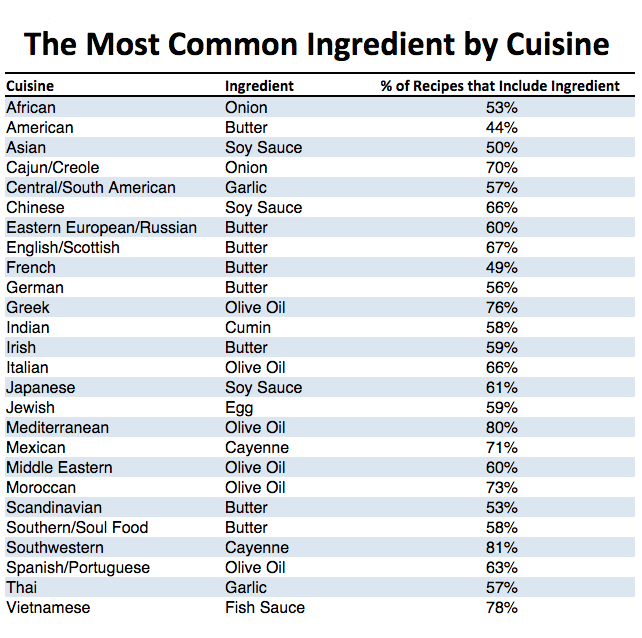 Using a dataset of 26 styles of cuisine from 13,000 recipes posted on Epicurious in 2013 they have presented their findings (shown below). Whilst the view is through an Americancentric lens, the results show there is a clear difference between the most common ingredients found in different types of cuisine. Perhaps unsurprising news, but a closer look sheds interesting light. Cayenne apppears to be the most commonly used ingredient of all appearing in 81% of Southwestern dishes. 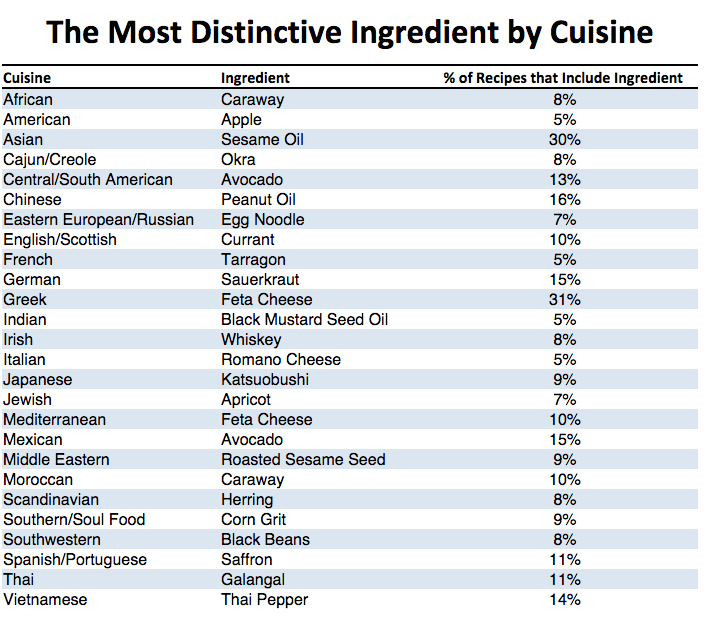 Interestingly eggs appear to be one of the most commonly used ingredients in Jewish cuisine at 59%. Secondly Priceconomics looked at ingredients which are most likely to appear in the recipes of certain types of cuisine. Defining ingredients include, Feta cheese in Greek cuisine, Avocado in Mexican, Galangal in Thai food and sesame oil in Asian food. Seemingly sterotypical of these global cuisines, English/Scottish food has conversely come out as containing alot of currants, which might be news to a nation! Perhaps you can spot some of your favourite ingredients, and why you gravitate towards a certain type of cuisine. We hope you enjoyed this food for thought, and perhaps you have your own theories?